A Bar or Bat Mitzvah is a time of great joy and pride for a family as they celebrate together the Jewish coming of age of their child. When a family has been personally affected by terror or war, this time can be one of anxiety and worry and great sadness. The loss of a loved one who will not be there to share in the celebration, the financial hardship caused by serious injuries and loss of work, all these conspire to make what should be a joyous time, a painful one instead. CTVP provides financial, physical, and emotional support to help families who have suffered these losses make Bar and Bat Mitzvahs for their children. 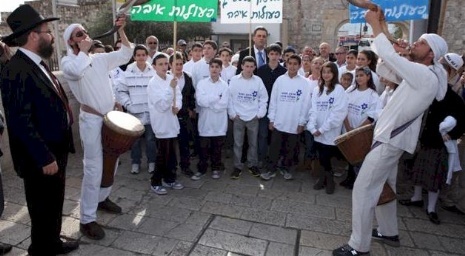 JERUSALEM—Naor Shalev Ben-Ezra, the 13-year-old boy who was stabbed and nearly killed by two Arab teenagers while riding his bicycle in the Jerusalem neighborhood of Pisgat Zeev two months ago, gathered with family and friends at the Kotel (Western Wall) today and was called to the Torah in celebration of his bar mitzvah. Among the guests was David Dalfon, a paramedic with the Magen Dovid Adom emergency rescue service who was the first responder at the scene and is credited with saving the young man’s life. 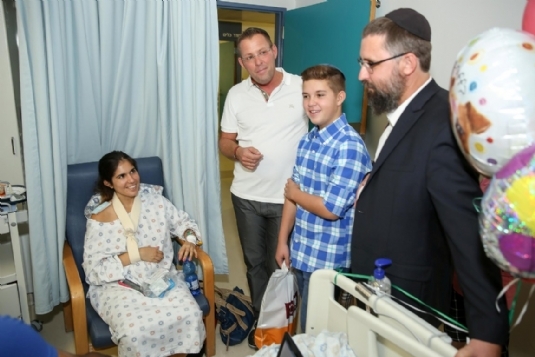 Following the attack, the critically wounded Ben-Ezra was rushed to the hospital, where doctors performed life-saving surgery, after which he spent a week in an induced coma, connected to a respirator. 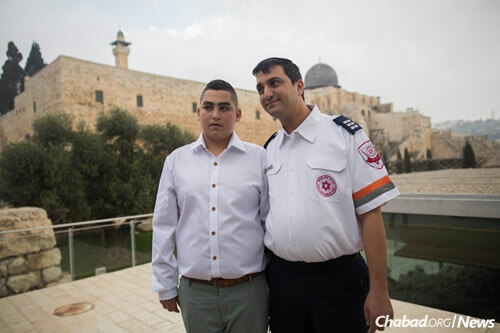 Naor with David Dalfon, a paramedic with the Magen Dovid Adom emergency rescue service who was the first responder at the scene and is credited with saving the young man’s life. 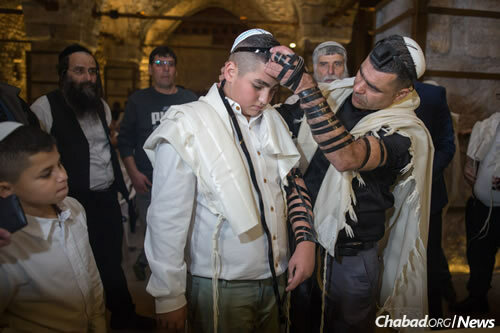 Wrapping tefillin before being called to the Torah. The terrible violence from terror attacks going on in Israel now did not stop one young man from carrying out his Bar Mitzvah dreams. 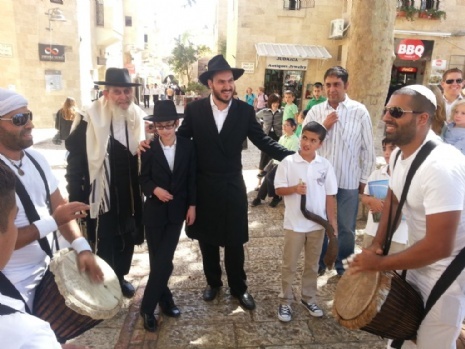 Simon W. from Vienna came with his family to celebrate his Bar Mitzvah in Jerusalem. Accompanied by Rabbis Kutner and Swerdlov of Chabad’s terror Victims Project (CTVP.ORG), Simon went to visit the victims of the attacks as part of his Chesed project. 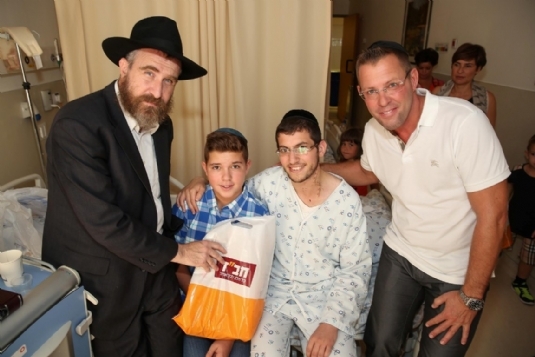 Going to the hospitals, Simon brought headsets, Tehillim and many other presents for each person. And he also brought his support and encouragement, his friendship and smiles. To a person, each person wounded in a terror attack was deeply touched that Simon would not let terror stop him - that he felt so strongly about Israel and her people that he was willing to come and show his solidarity with all of Israel. Deepest gratitude goes to Simon and his family for this act of lovingkindness and compassion. And Mazel Tov! on the Bar Mitzvah! 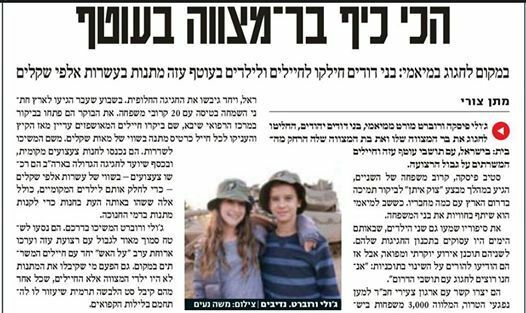 Yediot Achronot - Israel's primery Newspaper published an artilce on a special day of Chesed of a Bar and Bat Mitzvah girl from Miami who came who came to show solidarity with the wounded soldiers from "Operation Protective Edge" and with the soldiers who are still fighting on the front lines at the Gaza Border. Julie Fiske and Robert Mort from Miami, Jewish cousins, decided to celebrate his Bar Mitzvah and her Bat Mitzvah in Israel. But this was no ordinary celebration. During the Gaza War in Israel this past summer, a relative of both of them, Steve Fiske, went to Israel with friends to show solidarity and bring hope and support to soldiers on the front lines and families living in the south who were directly in the crosshairs of the rockets. When he came back to Miami, he shared his experiences in Israel with the entire family. Julie and Robert, who had been in the midst of planning their B’nai Mitzvah celebrations in Miami, were deeply moved by what they heard. So instead of the big parties their families were arranging, they both told their parents they wanted a change in plans. “We want to celebrate with the people in the South of Israel and the soldiers who fought in the war,” they said, and their families readily agreed to this new idea. The families contacted us at Chabad's Terror Victims Project (CTVP) and together we set up a new celebration. In December, Julie and Robert, accompanied by 20 relatives, flew to Israel, and escorted by CTVP, started their mission. 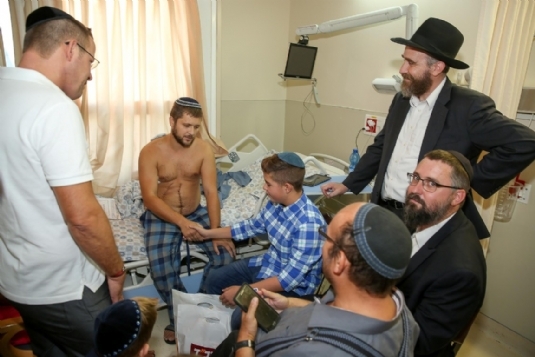 They began their day at the Sheba Medical Center where they visited soldiers who were wounded in the war and who are still in the hospital due to the severity of their injuries. They gave each soldier a gift card worth hundreds of shekels to purchase something meaningful to them. The soldiers were very touched by the generosity and caring of these two youngsters. From there they proceeded to Sderot, a city very close to Gaza, and often the target of rocket fire. 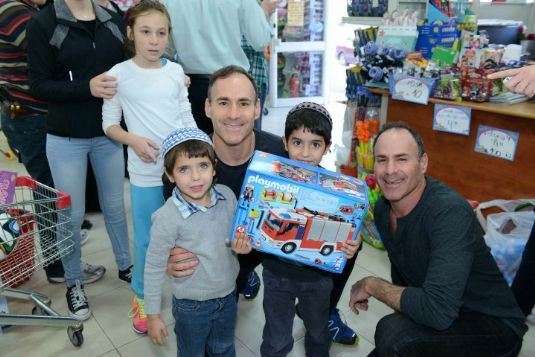 They went to a local toy store and, with the money that had been intended for their celebrations in the United States, Julie and Robert bought thousands of dollars of toys to distribute to the children of Sderot. They even included any child who happened to be in the store at the same time they were there. Then Julie and Robert went near the border with the Gaza Strip and held a barbeque for the soldiers who were serving there. In addition to the delicious dinner, they gave them long underwear to keep them warm during the long nights on the front when it can be very cold. Julie and Robert are extraordinary young people who care deeply about Israel, Jewish children, and the soldiers who so courageously defend and protect Israel for all of us. At an age when many young people are still somewhat self-absorbed, Julie and Robert instead gave from their hearts to bring courage, support, and compassion to Israel and her people. 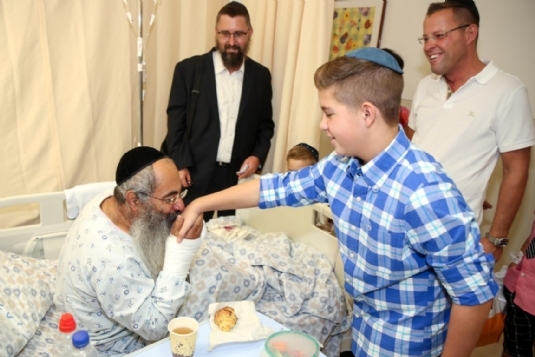 What they received in return was the everlasting gratitude of the soldiers in Sheba Medical Center and on the front lines, and the children of Sderot. These are gifts they will carry in their hearts for their entire lives. Mazel Tov Julie and Robert! Yasher Koach (Well-Done!)! Staff Sgt. Oz Mendelovich was 21 years old when he died in Gaza during this past summer’s Operation Protective Edge. He had joined the Israel Defense Forces in 2012, bravely following in the footsteps of his courageous father by serving in the famed but high-risk Golani Brigade. During the shiva for Oz, a delegation from Chabad’s Terror Victims Project (CTVP.ORG) visited with his family. 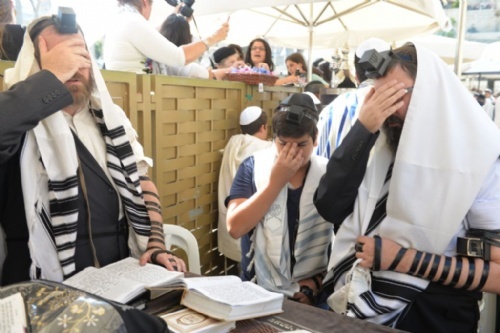 They were distraught and filled with pain and anguish at the loss of their son and told us that they were going to cancel a planned Bar Mitzvah for their younger son, Roee. With great compassion we told them we understood. And we said that CTVP would completely organize the whole Bar Mitzvah for just them and their family. They agreed and today, Monday, October 27, the family came to the Kotel to celebrate this very important and significant moment in Roee’s life. The ceremony was beautiful and very moving. There was singing and dancing and despite the pain of their loss which is still acute, the family was able to experience great joy. Rabbi Menachem Kutner, CTVP Director, made an emotional speech that included a special prayer for Oz and for all the other IDF soldiers who are still recovering in hospitals and rehabilitation centers throughout Israel. There wasn’t a dry eye as the emotions of joy and remembrance joined together. After the ceremony we took the family to a restaurant for a quiet and joyful continuation of the celebration. Osnat, the mother of Oz and Roee, told us over and over again how deeply grateful she and the whole family were for this very special day. She expressed such gratitude that all of us at CTVP have not forgotten her family but have been a strong support for them. She said this has helped them so much through this terribly difficult time. We were joined in the celebration by Rabbi Menashe Perman of Santiago, Chile who was at the Kotel with a lone soldier (a soldier without family in Israel) from Santiago. They added another dimension of celebration and meaning to the Bar Mitzvah. 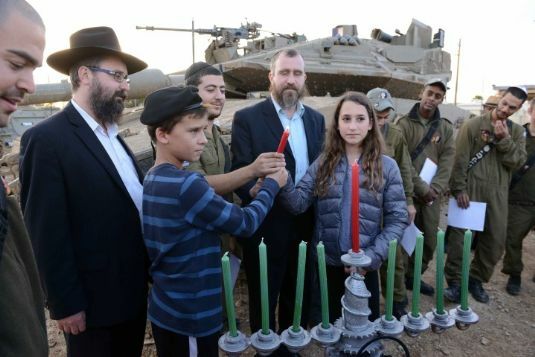 Rabbi Yosef Aronov, the Chairman of Chabad of Israel, expressed how vital and important it is that families like the Mendelovichs, who have lost precious loved ones in the defense of Israel, should never be forgotten. Everything possible must be done to help them financially, emotionally, spiritually and practically. They surely deserve our help and support as they struggle to regain their lives. A special thanks to Shahala Farivar who raised money from family & friends and helped make this day a reallity. Bat Mitzvah Girl from NY Uses her Special Occasion to Help Other Children. Ava Wildstein of Westchester, New York was celebrating her Bat Mitzvah and she wanted to use this special occasion to help other children, specifically girls like her of Bat Mitzvah age. So, along with her mother, Amy Wildstein, and their Chabad Rebbetzin, Mrs. Sara Wolf of Bedford New York, they came to Israel to fulfill Ava’s dream. 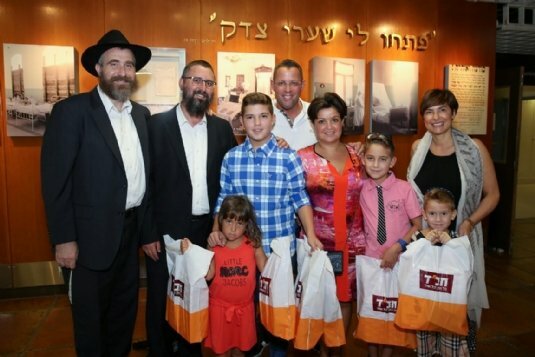 They landed in Israel on Thursday night, and first thing Friday morning they made their way to Sderot for a very special visit, organized by Yossi Swerdlov of Chabad Terror Victims Project (CTVP) and the Chabad Shluchim of Sderot, Rabbi and Mrs. Moshe Pisem. 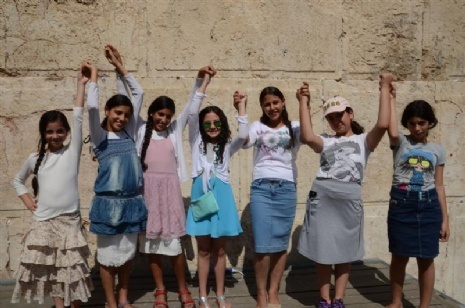 With the help of CTVP, Ava sponsored six girls from the city of Sderot (two of them twins; three of them orphans). Sderot, which is right in the line of fire from Gaza, has seen so many rocket attacks. For the children of this town, life is often filled with trauma and fear. In fact, Ava’s mother said that while they were in Sderot, they climbed to the top of a hill and they could see for themselves how close Gaza really is. They could see where the rockets are fired from. It was an eye-opening and frightening experience and made the importance of being there with the girls all the more vivid and real. They went to each girl’s home and Ava gave them IPod touches with their names inscribed on them so they could all stay in touch with her. Jerusalem and then on Sunday all of the girls from Sderot came to Jerusalem. They brought parents and siblings and friends with them. They had a special tour of the Kotel Tunnels Generational Center and a wonderful celebratory lunch at the delicious Between the Arches restaurant where they were entertained by magician and Shliach to Chevron Rabbi Viktor Atia and heard words of encouragement from CTVP director, Rabbi Menachem Kuter. The whole group then went to the Kotel for a beautiful and very emotional Bat Mitzvah ceremony led by Rebbetzin Sara Wolf and Rebbetzin Sima Pizem. It was a moving experience for everyone involved. Ava felt embraced by everyone she met. Her mother said that she is still absorbing it and that it will be very impactful for her. This was Ava’s first trip to Israel and she wants to go back again very soon. She was very touched by her time with CTVP and with the girls of Sderot and wants to do more to help. The family is already planning to return in December to continue the spirit of giving and helping that they began on this trip. 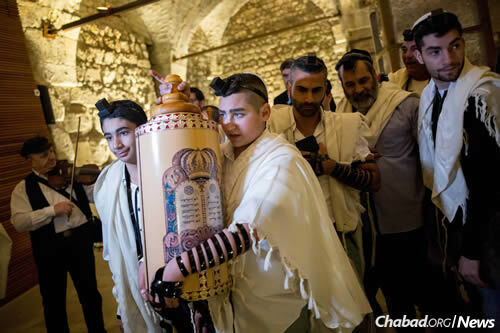 Eighty-six children in Israel, all of whom have directly experienced the pain of terror, celebrated beautiful Bar and Bat Mitzvahs at the Western Wall during Chanukah. 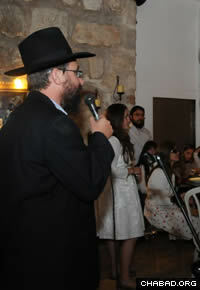 The event was organized by Chabad Terror Victims Project (CTVP). The children and their families came to Jerusalem from all over Israel for this once-in-a-lifetime rite of Jewish passage. Each of these children carries the scars of violent acts of terror, some of them on their own bodies, all of them on their souls. Some are children who were wounded themselves, some are orphans who lost beloved parents, and some are bereaved siblings. All of them cope with unbearable pain and loss on a daily basis. But with a courage that is awe-inspiring, each has chosen to rebuild their lives with bravery and determination. This special day, during which they celebrated their Bar and Bat Mitzvahs together, was a very happy day. It gave the children encouragement and strength to build their future lives as adults. 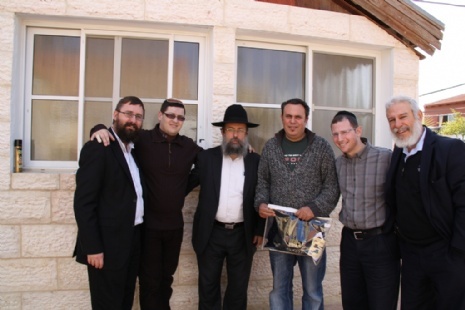 When the children arrived at the Ohel Yitzhak Synagogue in the Western Wall compound they were met by Rabbis Menachem Kutner and Yossi Swerdlov, along with other CTVP staff and volunteers. After breakfast and refreshments, the Bar and Bat Mitzvah ceremonies began. The boys were assisted by a group of volunteers from the Chabad Torat Emet Yeshiva of Jerusalem who helped each boy put on tefillin. At the same time, the girls were being assisted by volunteers of the Shoshanat Yerushalayim Seminary who organized a special program for them. At a special signal, all the children joined together with their families in a prayer service with singing and dancing. The culmination came when the boys were called to the Torah and their families showered them with candy. There was not a dry eye anywhere among the participants. After the ceremony, the Bar and Bat Mitzvah celebrants received a variety of gifts from CTVP. Each child received a Chitat Bible set and a beautiful Chanukah menorah. The girls also received a sterling silver candle holder for Shabbat. In personal visits before the Bar and Bat Mitzvah celebration, CTVP brought the boys beautiful Tallit and tefillin sets. 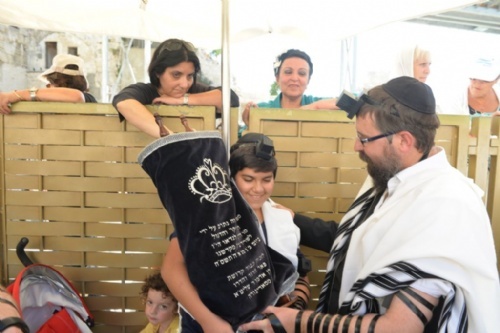 During the coming months CTVP will continue to visit children in their homes and provide them with the Tallit and tefillin sets in accordance with their actual Bar Mitzvah date. This beautiful event followed a request that Chabad of Israel received from the official government body responsible for the terror victims in Israel -- Irgun Hayitzig. They asked CVTP for help in organizing this special Bar and Bat Mitzvah ceremony. CTVP was honored to be of help and organized all the religious elements of the day. 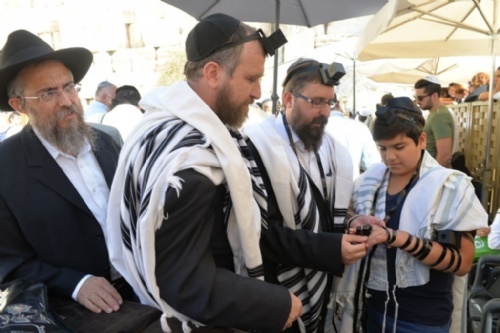 After the emotional ceremony at the Western Wall, a special reception was held where the children were greeted by Rabbi Shmuel Rabinowitz, Rabbi of the Kotel and Holy Places; Minister Eli Yishai; Deputy Foreign Minister Danny Ayalon. During lunch they were addressed by Member of Knesset Shaul Mofaz. In the evening a special Chanukah candle-lighting ceremony was held at the home of President Shimon Peres. 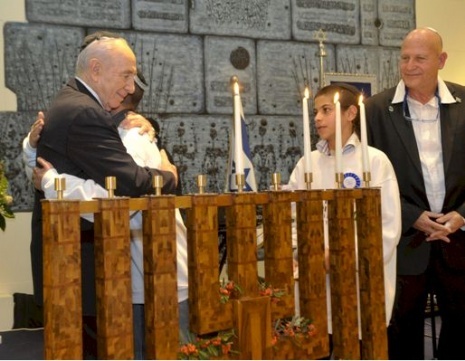 President Peres met with the children, lit candles with them, and blessed them at this very moving gathering. The families were deeply grateful to Chabad and thanked them for helping organize this very beautiful and happy day, as well as for all the support and encouragement they receive during the entire year. There is giving Tzedakah, and then there is hands-on help. Some generous CTVP supporters de cided they wanted to do more than provide financial assistance to terror victims and their families. They wanted to become directly involved in a hands-on way. So every time they come to Israel, they visit families of terror victims. On January 26 they spent an entire day helping to distribute Tallitot and Tefillin to boys whose actual Bar Mitzvah days were coming up. They went to Jerusalem, Beit Shemesh, Beer Sheva, Ashkelon and Sderot. In each city they brought the warmth of their caring and compassion directly to families who had suffered so much. Accompanying CTVP staff was Mr. Yudi Zeller, his son Benjamin along with Mr. Selig Bergman and Ami Paicovsky. Two boys, both Bar Mitzvah age. One has grown up in Zurich, Switzerland, the other in Israel. Their lives have taken very different paths but recently they shared a wonderful, memorable, exciting day as Bar Mitzvah “twins”. 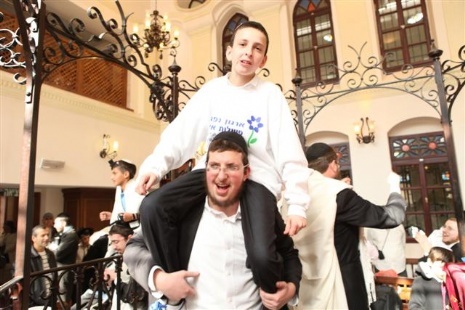 Menachem Mendel Slutzkin of Zurich and his family had made the decision that they wanted to enhance his special coming of age by twinning with a boy in Israel whose family had been deeply impacted by terror. They consulted with Rabbi Menachem Kutner, Director of Chabad Terror Victims Project, and together they decided that Roy would be Menachem Mendel’s twin. Roy’s father was very seriously wounded when he was a soldier in the Israel Defense Forces’ elite Golani Brigade. He was in the dangerous town of Nablus when a terrorist shot him in the head at very close range. It has taken a long and painful rehabilitation but thankfully Roy’s father is doing well. His recovery has been called a medical miracle. He and his wife are raising a family together and have three wonderful children, Roy one of them. 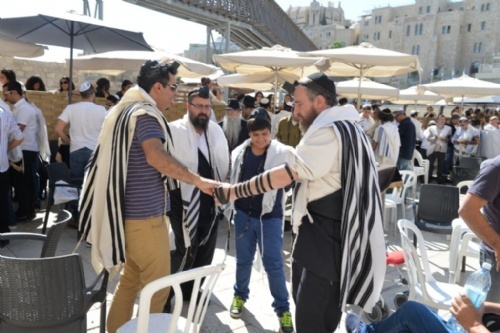 Before the moving ceremony at the Western Wall, Menachem Mendel gave Roy a beautiful tallit and set of tefillin, both as a Bar Mitzvah gift and to recognize the great sacrifice Roy’s father has made for Israel and the Jewish people. Then together the two boys celebrated their Bar Mitzvah. 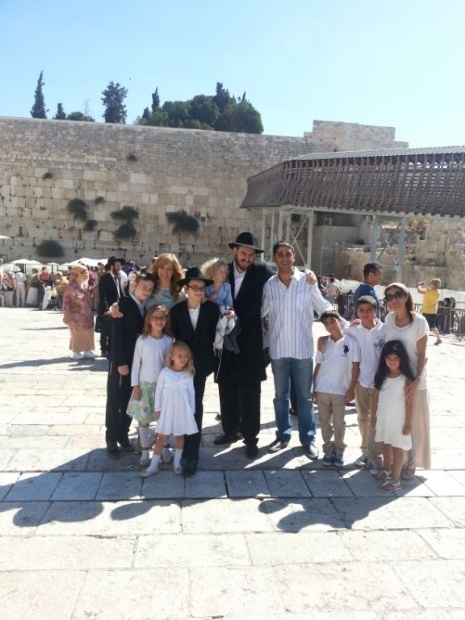 They and their families danced and sang at the Western Wall with a joy and thankfulness that radiated from all of them. 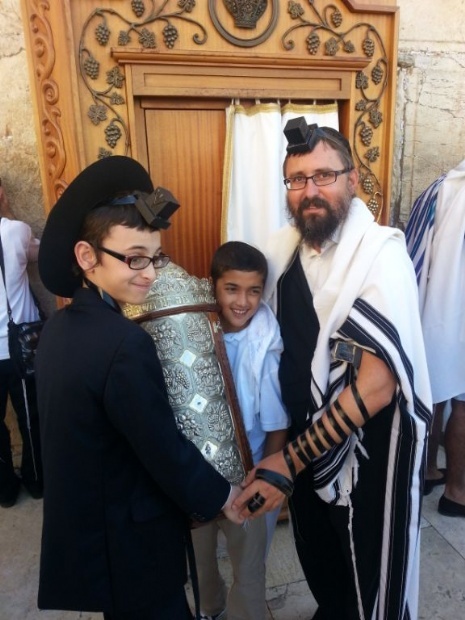 With the guidance of Rabbi Kutner, CTVP’s director, both Bar Mitzvah boys rejoiced with the Torah. 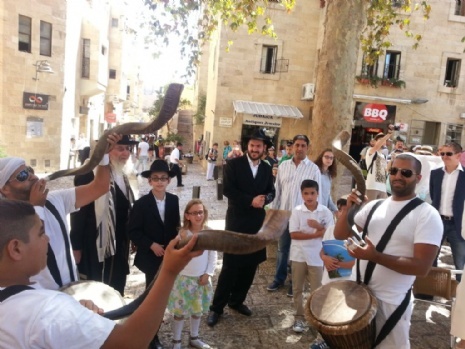 Then the families marched together in a joyous procession, accompanied by trumpets and drums, to the Tzemach Tzedek Synagogue in the Old City where there was a festive meal. During the meal, Menachem Mendel’s father spoke, thanking CTVP for the wonderful opportunity for their family to participate in this meaningful joint Bar Mitzvah. Then Roy’s father spoke about the circumstances of his injury at the hands of terrorists and the extraordinary rehabilitation process he has gone through. He thanked both Chabad Terror Victims Project and the Slutzkin family for this beautiful day, for their recognition of what his family has gone through, and for their wonderful solidarity with Roy, with him, and with his whole family. He thanked CTVP as well for all the help and support they have provided since he was wounded. A Surprise Visit to the Children of Sderot! 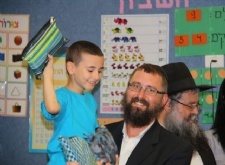 First-grade children in the beleaguered city of Sderot in the south of Israel received a wonderful surprise visit from the Roisen family, who are part of Rabbi Zvi Greenblatt’s community in Argentina. The family was in Israel to celebrate the Bat Mitzvah of their daughter Dina and wanted to share their happiness with the children. 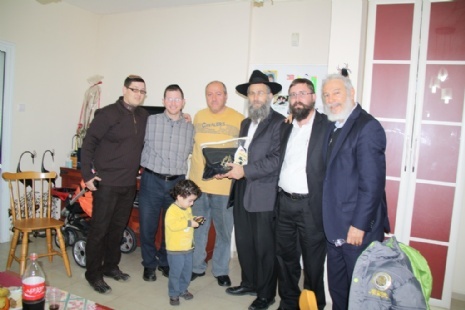 The Roisens, accompanied by Rabbi Yossi Swerdlov brought beautiful gifts for the children to celebrate the New Year. The packages included a jar of honey for each child and a letter filled with blessings for the New Year. As well they brought gift packages from Chabad of Mequon in Wisconsin that contained a wonderful verity of school supplies. Dina, who was celebrating her Bat Mitzvah, and her family, handed each child their gift package individually, their warm smiles and greetings showing the children how much the family cares about them and thinks of them. 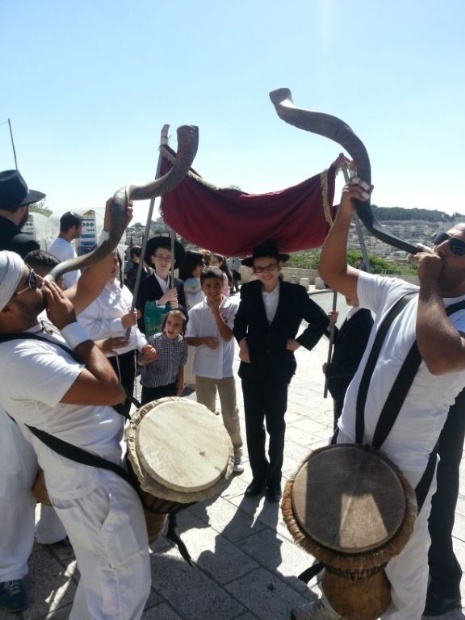 Everyone was moved and delighted when Rabbi Moshe Zeev Pizem, Chabad Shaliach of Sderot, blew the shofar and explained the meaning of this special custom that characterizes this time of the year. Rabbi Menachem Kutner, Director of of Chabad Terror Victims Project (CTVP), addressed the children and congratulated them. He thanked the school for their warm hospitality. From there Dina and her family went to visit a family whose house had been hit by a Kassam missile the Friday before. Miraculously there were no casualties. Gifts were given to the children of this family as well. Everyone wished each other a good and sweet New Year. The miracle of the family’s safe escape from harm moved the group to break out in spontaneous and spirited song and dance in gratitude that no one was hurt. The entire visit was a very moving one for the Rosen family, for the children and families of Sderot, and for CTVP. 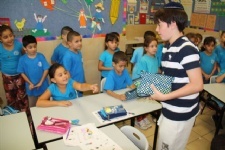 The kindness, generosity and warmth expressed will live long in the minds and hearts of the children in Sderot. And for the Rosen family, this day will live on in their hearts as well. Prior to the attack, Mr. Suissa’s left leg had been amputated, and a second attack left Mr. Suissa’s right leg paralyzed. Because Assaf’s mother Lilach Suissa is legally blind, adult responsibilities - shopping, accompanying his father to doctors’ visits, cleaning - fall to Assaf. Assaf himself a survivor of childhood cancer spends most of his free time at home, caring for his younger brother Bar, 9. Kaylee Andrusier, center, and her newfound friends from Sderot celebrate their collective Bat Mitzvah at the Western Wall. Kaylee Andrusier’s Bat Mitzvah celebration wasn’t about the party or the gifts. For the Bal Harbour, Fla., resident, it was about bringing happiness to fellow 12-year-old girls living in the shadow of Palestinian rocket fire. “I always had a thing in my heart for orphans, and I love Israel,” Andrusier says in explaining why she decided to take her own Bat Mitzvah gifts and make a party for 12 girls from Sderot, a southern Israeli town practically bordering the Gaza Strip. 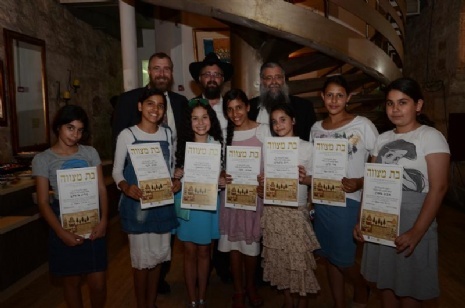 Last Wednesday, Andrusier and her family celebrated with the group of girls during a day of activities in Jerusalem organized by Rabbi Menachem Kutner of the Chabad Terror Victims Project. 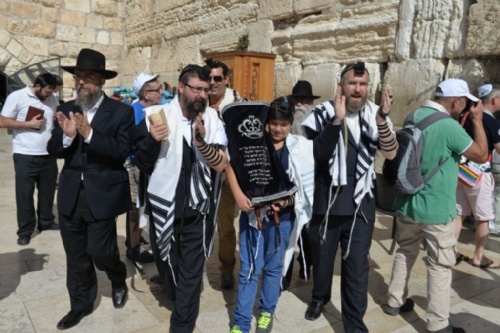 The 12-year-old, parents Yaakov and Devorah Andrusier and grandparents Chabad-Lubavitch Rabbi Sholom and Chana Lipskar of The Shul of Bal Harbour stood at one of the Old City’s gates to welcome their guests, escorted by Chabad of Sderot directors Rabbi Moshe and Sima Pizem. The group then proceeded to the Western Wall before heading to a guided tour of the Generations Center and a dinner party at a nearby restaurant. Her mother couldn’t agree more. Rabbi Menachem Kutner of the Chabad Terror Victims Project addresses the girls. Of the 12 girls who attended, four had lost a parent to Palestinian attacks. Another lost her hearing and another still speaks with a stutter because of the trauma of an explosion. Shir Kuznitz, who lost her mother a while back, says she met a new friend. Andrusier, who had been pen-pals with one of the girls before the party, and the rest of the group exchanged e-mail addresses and pledged to stay in touch. She’s already planning to visit them in Sderot this December.